A Stock Profile is a named collection of products with quantities set against them, with each profile having a priority setting and [optionally] an active date range. A product can exist within different profiles and there is no limit to the number of profiles the system supports. 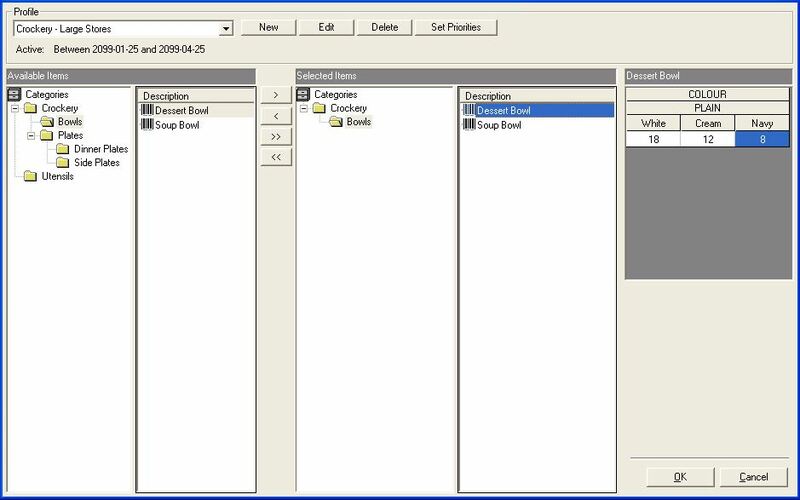 To create a new Stock Profile access Stock Profiles in the DRP suite in the Stock menu. 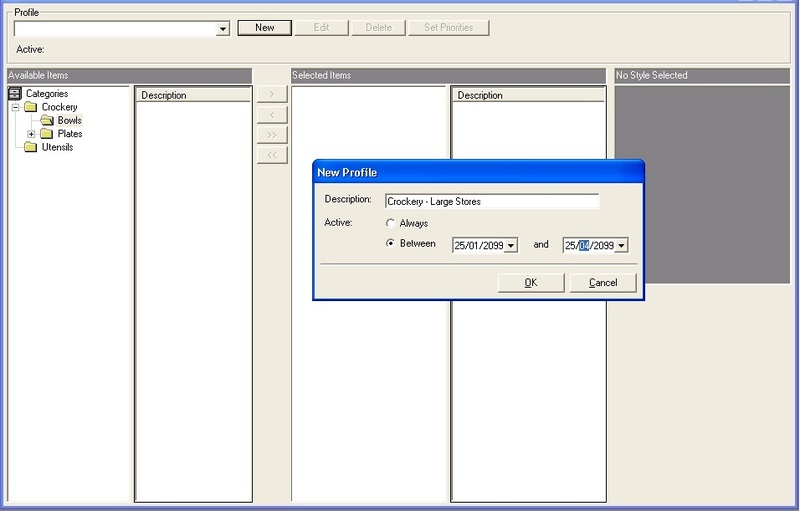 Select New and enter the name of the stock profile you are creating, be careful to give your profiles meaningful names as this will make it much easier when managing the profiles. For each profile you can either chose to make it always active or select start and finish dates, useful if the stock profile is seasonal or set up for a specific event e.g. January Sales. Click Ok and the profile is created, profiles can also be edited or deleted by selecting the relevant profile from the drop down. To add products to the profile select the relevant category from the Available Items column on the left, the products in that category will appear in the column headed Description on the right. You can add products by highlighting a single item or highlighting several items by holding down the shift key as you select them and then clicking on the > button. To set quantities against a product simply highlight the relevant item and a matrix will appear in the right hand column allowing you to add stock levels against each item. As previously noted a product can exist within different profiles so you can set priorities for the profiles, i.e. if two profiles containing the same product are set against the same location which one takes priority. You can then reorganise the priorities using the buttons at the side of the window. Click Ok when complete to save. For larger versions of all the screenshots please see the attached documents below.